"The Lord appeared to Abraham by the oaks of Mamre, as he sat at the entrance of his tent in the heat of the day. 2 He looked up and saw three men standing near him. When he saw them, he ran from the tent entrance to meet them, and bowed down to the ground.3 He said, “My lord, if I find favor with you, do not pass by your servant. 4 Let a little water be brought, and wash your feet, and rest yourselves under the tree. 5 Let me bring a little bread, that you may refresh yourselves, and after that you may pass on—since you have come to your servant.” So they said, “Do as you have said.” 6 And Abraham hastened into the tent to Sarah, and said, “Make ready quickly three measures of choice flour, knead it, and make cakes.” 7 Abraham ran to the herd, and took a calf, tender and good, and gave it to the servant, who hastened to prepare it. 8 Then he took curds and milk and the calf that he had prepared, and set it before them; and he stood by them under the tree while they ate. I've always thought this exchange was funny…"you laughed, no I didn't, yes you did…" And I've always felt an affinity for Sarah (or Sarai) in Genesis because we share the same name, and apparently, the same fate: Childlessness. I've written about aspects of my infertility/subfertility before - like here where I wrote about a few things I've learned over the years we've been married, I touched on our life situation in the post about me, and here where I list out a few saints that women can turn to in times of trouble (infertility included). But for the most part, I keep to myself about our struggles with trying to conceive. It's a highly personal subject, and I'm a fairly introverted person, so that's all there is to be said about that. 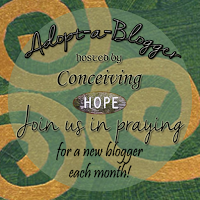 But last night I got an email from Conceiving Hope saying that I'd been chosen to be the blogger to garner all the prayers in the month of August, for her "Adopt-a-Blogger" monthly prayer ministry. Talk about being honoured and flattered and honoured some more, and then just plain grateful! Part of being blogger of the month entails writing a post about your own struggles, so while I will continue to be private about the specific details, I will elaborate a little - if only to encourage other ladies out there with similar burdens, to help them know they are not alone! My name is Sarah and I've been married 11 years as of last May. We have no children. Several years ago we embarked on testing - found a NaPro doctor, started charting through Creighton, etc. but had no success in getting answers. Thoroughly wrung out from that experience, we stopped everything for several years. Recently though, having been given some new information, we found out that I've got issues with my thyroid, and we've been given good news in regards to the state of my health. We have reason to cautiously hope that my body will be able to do what it is supposed to do at some point, so we continue to move forward, trying to heal and work through the issues that have popped up. I want you to know that I am deeply moved by your prayers - by every single one of your novenas and rosaries and anything else, big or small that you offer up for me. Know that I will also pray in turn for all of you and your intentions. We really are all connected in the Body of Christ, aren't we? One more thing - if any of our readers want to get in on all the action, by all means, email me! I will be prayerfully considering who to recommend for next month so if you are struggling with in- or sub fertility, please let me know. So excited to pray for you this month! I love that you found that icon too, what a steal! Just found you through Conceiving Hope's adopt a blogger post! I'll be praying for you this month! Just said a prayer for you! I find that St. Josemaria so striking...what can it mean?